8.4 Sponsored Communist Party "Jobs Bill"
Bobby L. Rush is a far left Democratic member of the United States House of Representatives, representing the 1st district of Illinois. He is married to Carolyn Rush. Rush is an honorably discharged Army veteran and an ordained minister with a Master’s Degree in Theology. In addition to his congressional responsibilities, Rush is the pastor of the Beloved Community Christian Church of Chicago. He and his wife of more than years, Carolyn Rush , have a blended family with six children including a son who lost his life to gun violence in 1999. Bobby Rush was born in Albany, Georgia on November 23, 1946. His family moved to Chicago when he was young, where they settled on the West Side. Bobby Rush attended Marshall High School. After dropping out of high school, Rush joined the U.S. Army in 1963, joining the Student Non-Violent Coordinating Committee in 1966. He went AWOL in 1968, co-founded the state's Black Panther Party while stationed in Chicago and received an honorable discharge in 1968. Earlier that same year Rush stated the philosophy his membership in the Black Panthers saying, "Black people have been on the defensive for all these years. The trend now is not to wait to be attacked. We advocate offensive violence against the power structure. 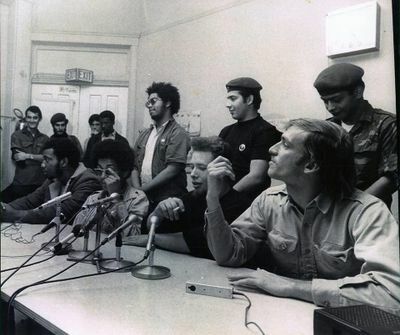 Imprisoned for six months in 1972 on a weapons charge after carrying a gun into a police station, Rush nonetheless worked on several non-violent projects that built support for the Black Panthers in African American communities. He coordinated a medical clinic that offered sickle-cell anemia testing on an unprecedented scale. Rush graduated with honors from Chicago's Roosevelt University in 1973. A year later he left the Panthers, who were already in decline. "We started glorifying thuggery and drugs," he told People. That was distasteful to the deeply religious Rush, who is a born-again Christian. He went on to say that "I don't repudiate any of my involvement in the Panther party—it was part of my maturing." He subsequently resumed his education in the early 1990s at the McCormick Seminary and received a master's degree in theology. After leaving the Panther Party, Rush sold insurance for a time in the early 1970s. Rush ran for a seat on Chicago's City Council in 1974. The first of several black militants who later sought political office, he was defeated. In 1983, however, Chicago's political life was transformed by the election of leftist Harold Washington to the Mayoralty. That same year, Rush was elected alderman from the Second Ward on Chicago's South Side. He was one of the pro-Harold Washington faction on the Council during the "Council Wars" that began in 1983 following Washington's election as Mayor of Chicago in a racially-polarized contest. In 1998 Bobby Rush was busy preparing for a tilt at the Chicago mayoralty. At his campaign launch, Rush was introduced by Communist Party USA affiliates Reps Danny Davis, Jesse Jackson, Jr., and Mexican-American activist Emma Lozano, as well as by anti police brutality activist Rev. Jaul Jakes. With months to go until a formal announcement, Congressman Bobby Rush (D-1) has been preparing the groundwork for a full-scale grassroots campaign to take him to the fifth floor of City Hall by organizing the disenfranchised majority of Chicago's residents. The South Sider promises to provide a voice for poor and working people in city policies concerning housing, wages and economic opportunities. Since the end of August, Rush has been meeting with community residents and campaign volunteers in what has come to be called the Rush for Change Organizing Committee. Setting a minimum goal of 50,000 registered voters and $250,000 in campaign funds by November before he officially announces his candidacy for mayor, Rush has been working to form a coalition of African Americans, Latinos and progressives into what he calls the democratic vanguard of the possible to help him unseat Richard M. Daley in the Spring. After some consideration, the December 12th, 1998, General Membership meeting of Chicago DSA voted to endorse Bobby Rush for Mayor of Chicago and a mix of nine incumbent and insurgent aldermanic candidates. Bobby Rush lostthe race, receiving less than 30% of the vote. When Bobby Rush ran for Congress in 1998, Democratic Socialists of America did not officially endorse any candidates but he was "recommended" as worthy of a voteby Chicago DSA. Bobby Rush is not a member of the Progressive Caucus, though he should be. 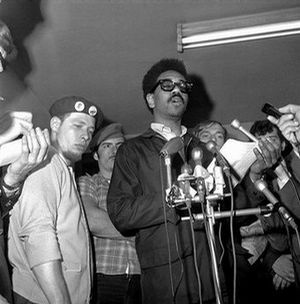 Circa 1969, Bobby Rush, Minister of Defense, Illinois Black Panther Party, was listed as a sponsor of the Socialist Workers Party-led GI Civil Liberties Defense Committee. On November 16, 1989, Bobby Rush and Carolyn Rush served on the Tribute Committee for the Chicago Committee to Defend the Bill of Rights Tribute to Leon Golub and Lucy Montgomery, held at the Congress Hotel, Chicago. At Canter's memorial service, Congressman Bobby Rush addressed the mourners, saying that the highest praise he could give David Canter was that there wasn’t a racist bone in his body. 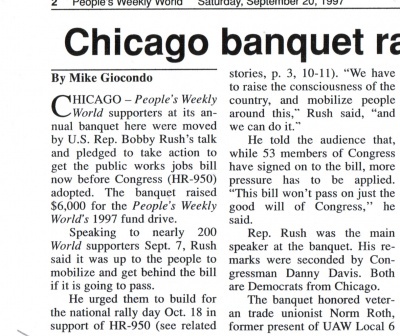 Bobby Rush was the guest speaker at the Chicago Communist Party USA's annual People's Weekly World fundraising banquet, September 20, 1997, which raised $6,000 to support the communist newspaper. 1997. Rep. Rush urged support for the Martinez Jobs Bill (HR-950), then before Congress. His sentiments were echoed by Congressman Danny Davis. Rush was introduced by Katie Jordan of the Coalition of Labor Union Women. In 1997 The World Federation of Democratic Youth (WFDY), based in Budapest, denounced the U.S. Treasury Department's denial of a license for hundreds of young people from all over the U.S. to attend the 14th World Festival of Youth and Students in Havana, Cuba. WFDY, an initiator of the festival scheduled for July 28 to Aug. 5, assailed the anti-democratic character of the decision and pledged an international campaign to demand that the U.S. government lift the travel ban. Nationally, the broad list of sponsors and endorsers has already begun to mount a campaign. Members of the U.S. Congress, Ron Dellums (D-Calif.), Jesse Jackson Jr and Bobby Rush, both Illinois Democrats, have offered support. H.R. 950, the Job Creation and Infrastructure Restoration Act of 1997 was introduced in the 105th Congress on March 5, 1997 by Congressman Matthew Martinez of California. It had 33 original co-sponsors, including Bobby Rush. The primary purpose of this emergency federal jobs legislation was to provide much needed jobs at union wages to crisis ridden cities by putting the unemployed to work rebuilding our nation's infrastructure (schools, housing, hospitals, libraries, public transportation, highways, parks, environmental improvements, etc. $250 billion is authorized for emergency public works jobs over a five year period. On October 18 1997, Tom Balanoff, president of SEIU local 73, and Chicago Jobs with Justice, and Rep. Bobby Rush addressed a Chicago "show us the living wage jobs" rally, as part of a national day of action, calling on Congress to pass the Martinez Jobs Bill. there were concurrent rallies in nearly 20 cities, organized by the Communist Party USA dominated National Labor-Community Coalition For Public Works Jobs. Rev. Addie Wyatt's home was used to carry out meetings with public figures such as Rev. Jesse Jackson, President Barack Obama, and US Rep. Bobby Rush. In 2000, Bobby Rush served as Co-Chairperson on the welcoming committee for the Chicago Memorial Service for Richard Criley, a long-time activist with the Communist Party USA and a leader of the Chicago Committee to Defend the Bill of Rights. Kathy Kelly, two-time nominee for the Nobel Peace Prize, and Ishmael Flory, long-time member of the Communist Party USA, headed the list of honorees at the 2002 annual Chicago People’s Weekly World/Nuestro Mundo banquet. Barbara Moore, vice president of the Coalition to Protect Public Housing, and a representative of the Carousel Linen workers rounded out the list of those who had been nominated to receive the Chris Hani/Rudy Lozano Award. William McNary, president of USAction, was be the keynote speaker. "People’s artist" Peggy Lipschutz and singer Kristin Lems highlighted the afternoon’s cultural presentation. Bachtell, organizer of the Illinois district of the Communist Party, said the election will be “even more crucial” if the Bush administration succeeds in its effort to win congressional approval for launching a war against Iraq. “We simply cannot allow such a crime to happen,” he said. The Chris Hani/Rudy Lozano Award is named in honor of Chris Hani, one-time commander of the armed wing of African National Congress and General Secretary of the South African Communist Party, and Rudy Lozano, a Mexican-American activist and key player in the campaign that elected Harold Washington as Chicago mayor in 1983. Both were gunned down by assassins. In addition to Bachtell, banquet sponsors included Rev. Willie Barrow, chair, Rainbow/PUSH Coalition board of directors; Chicago Alderman Theodore Thomas; Katie Jordan, president, Chicago Coalition of Labor Union Women; Rep. Bobby Rush; and Tom Balanoff, president, SEIU Local 1. Doors opened at 2 p.m., Oct. 20, at the Three Happiness Café, 2130 S. Wentworth. 1996-1997, Helene Slessarev-Jamir was an urban policy consultant, strategist to Rep. Bobby Rush. In 2007, Bobby Rush was an honorary host for the 25th Anniversary of the Crossroads Fund. The fund, founded in 1981 supports community organizations working on "issues of social and economic justice" in the Chicago area. As of February 20 2009 Bobby Rush was listed as a member of the Congressional Progressive Caucus. Bobby Rush signed the letter. In early April 2009, Rep. Barbara Lee led a congressional delegation to Havana for a 4-1/2 hour meeting with Raul Castro, telling reporters, "All of us are convinced that President Castro would like normal relations and would see normalization, ending the embargo, as beneficial to both countries." Reuters reported that Lee's delegation "avoided specifics" with Castro "but were struck by his humor, impressed by his involvement in Third World causes and firm in their belief that he wants to end U.S.-Cuba enmity." The meeting between Castro, Lee, and five other members of the Congressional Black Caucus, took place in secret without the customary presence of a US State Department official. No reporters attended, and according to the New York Times, Cuban television, which covered the visit, offered no details of what was said. Reps. Emanuel Cleaver (D-MO), Marcia L. Fudge (D-OH), Laura Richardson (D-CA), Bobby Rush (D-IL), Melvin Luther Watt (D-CA), and Barbara Lee. "Also particpating were Patrice Willougby, executive assistant to the Congressional Black Caucus, and Eulada Watt, wife of Congressman Mel Watt,". Bobby Rush said he found Raul Castro "to be just the opposite of how he's being portrayed in the media." AP quotes Rush as saying, "I think what really surprised me, but also endeared to him was his keen sense of humor, his sense of history and his basic human qualities." At times, Rush said, the lawmakers and Castro chatted "like old family members." Two caucus members, Reps. Emanuel Cleaver of Missouri and Bobby Rush of Illinois, preached sermons at two Cuban churches to commemorate the anniversary of King's assassination. My support for an expanded trade relationship with Cuba goes back several years. Most notably, the vote I cast in support of the Trade Sanctions Reform and Export Enhancement Act, a bill signed into law by President Clinton in October, 2000, that lifted sanctions on sales of agricultural commodities and medicine. While our party suffered an epic loss of the White House only a few weeks later, within five years after that bill became law, total sales of farm products to Cuba dramatically increased from virtually zero to $380 million by 2005. Yes, my hopes for Cuba include democratic freedoms. While this issue was not a major focus of this trip, it is certainly a concern of mine and other members of our delegation. The fact is that I did meet with many Afro Cubans during our meeting with Cuban President Raul Castro. Last week, when I returned to my district, I spoke to a capacity Latin American audience where I, once again, heard moving stories of their struggles for equality, a struggle that mirrors our nation's civil rights legacy. I am absolutely convinced that the injustices that have been visited upon the citizens of Cuba will be addressed and that they will be addressed quickly. On April 27, I will chair a congressional hearing on the status of America's trade relationship with Cuba. That hearing is just the beginning of a series of steps I intend to take to open up markets for U. S. commerce--especially among small, minority- and women-owned businesses. A trade relationship will also help to shine a spotlight on the plight of those who suffer under a regime that remains repressive in many ways. 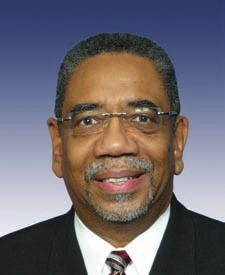 Rep. Bobby Rush, D-Ill., who participated on a Congressional Black Caucus delegation to Cuba in March 2009 and met with former President Fidel Castro, introduced the US-Cuba Trade Normalization Act, which would repeal the Helms-Burton and Torricelli Acts and end the embargo against Cuba. The bill has 55 co-sponsors. Bobby Rush for Congress has been a client of Robert Creamer's Strategic Consulting Group. Honorary Hosts were Representative Bobby Rush, and Alcee Hastings. Rep. Luis Gutierrez (chair of the House Subcommittee on Financial Institutions and Consumer Credit) held a Congressional hearing January 21 on the issue of FPOB/PNB and community banks. We sent more than 60 people to Washington. We gained the support of Rep. Danny Davis; Rep. Bobby Rush; State Sen. Don Harmon; David Pope, President of the Village Board, Oak Park; and State Rep. LaShawn Ford. Sponsored by Sen. Don Harmon, Senate Joint Resolution 81 has passed the Illinois Senate and moves to the Illinois House, where it is cosponsored by Karen Yarbrough, Angelo Saviano, Deborah L. Graham, LaShawn Ford, and Marlow H. Colvin. The resolution "urges the United States House of Representatives Financial Services Committee and the United States Senate Committee on Banking, Housing, and Urban Affairs to continue hearings to investigate the FDIC's seizure of Park National Bank." December 16, 2009, the Chicago City Council joined with our coalition in demanding a Congressional hearing to investigate the seizure and sale of First Bank of Oak Park/Park National Bank and the repercussions for other community banks reinvesting in our communities. As reported by the Chicago Sun-Times, Chicago aldermen condemned as "absurd, bordering on criminal" the federal government's decision to seize Park National Bank." Within a month of the seizure, community groups that comprise the Coalition delivered petitions with over 1,000 signatures to the D.C. office of Rep. Luis Gutierrez. In mid November 2010, a delegation from the Committee to Stop FBI Repression ( returned home from several days of bringing the "issue of the FBI raids and grand jury subpoenas of people doing international solidarity work and anti-war organizing to the U.S. Capitol". Three supporters of the Marxist-Leninist Freedom Road Socialist Organization/FightBack!, Deb Konechne of the Committee to Stop FBI Repression, Anh Pham, who is facing a reactivation of her subpoena and Joe Iosbaker, whose home was raided, spent two days meeting with U.S. Representatives on the issue. The delegation asked each Congressperson to sponsor a “Dear Colleague” letter condemning the raids and grand jury subpoenas. In the two days, the delegation met with either the Congressional Representative’s staff or the Representative themselves from the following 16 offices: Tammy Baldwin (WI), John Conyers (MI), Danny Davis (IL), Keith Ellison (MN), Raul Grijalva (AZ), Luis Gutierrez (IL), Mike Honda (CA), Jesse Jackson, Jr. (IL), Dennis Kucinich (OH), Barbara Lee (CA), Jim McDermott (WA), Jim McGovern (MA), Bobby Rush (IL), Linda Sanchez (CA), Jan Schakowsky (IL), Maxine Waters (CA). The "meetings were positive, with all the offices expressing genuine concern about the situation. In some cases, because of the outpouring of calls from around the country, the U.S. Representatives were aware that the delegation was in Washington D.C. and the offices made time on their schedules to meet with the delegation. This reinforces the continuing importance of the solidarity work taking place around the country." Rep. Conyers (MI), chair of the Judiciary Committee, directed the Counsel of the Judiciary Committee to meet with the delegation. Also, Rep. Ellison (MN) and his Congressional staff met directly with the delegation for a significant amount of time. rep. Ellison sent a letter to U.S. Attorney General Eric Holder, expressing concern over the situation and is continuing to work on options to support his constituents affected. The delegation also received face-to-face meetings with Rep Gutierrez and Rep Davis from Chicago. Rep. Grijalva’s (AZ) office set up a meeting between the delegation and the Executive Director of the Congressional Progressive Caucus in the Congress of which rep. Grijalva is the chair. In addition, the office of Jan Schakowsky (IL) and Maxine Waters (CA) gave the delegation significant time and attention. “It was clear that progressive Representatives of the Congress are very concerned about the FBI investigation. Overall, they were very thankful for our visit and for the information and analysis given to them The level of awareness about the raids and grand jury was varied, from little to full awareness, but the delegation certainly changed that. After the two days, our presence and purpose definitely created a stir in the halls of Congress. “The fact that we were able to interact with 16 legislative aides or Congress people themselves, during an extremely busy time of restructuring leadership in the Congress, exemplifies the attention this matter is receiving”, stated Joe Iosbaker. 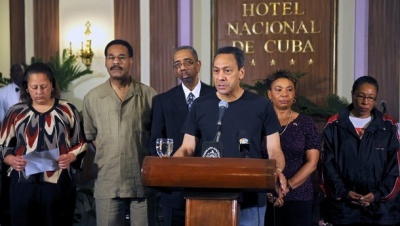 During the June 2012 'Five Days for the Five' in Washington DC , Latin American parliamentarians advocating for the imprisoned spies known as the Cuban Five, met with two members of the Congressional Black Caucus, Bobby Rush and Yvette Clarke. The delegation of Latin Americans who made the trip to Washington to encourage their U.S. counterparts to become involved in finding a solution to the unjust imprisonment of the Five included congressional representatives Glauber Braga Socialist Party of Brazil; Hugo Gutierrez, Communist Party of Chile; Armando Aguilar , Ecuador; Damián Alegría, of the communist leaning Frente Farabundo Martí El Salvador; Alba Palacios, Sandinista, Nicaragua; and Chilean Senator Alejandro Navarro, Broad Social Movement, former leader of the Socialist Party of Chile. Italian Gianni Vattimo, a member of the European Union Parliament, for the Party of Italian Communists also participated. Rush, who traveled to Cuba in 2009 and pledged to visit the Five upon his return, reiterated his commitment to do so, with other members of the Congressional Black Caucus, to support the prisoners and draw attention to the case. Representative Clarke, who recalled that her parents were Jamaican immigrants and whose district includes many residents with Caribbean roots, expressed her interest in improving relations between Cuba and the United States, acknowledging that resolving the case of the Five is important to that process. She commented that an ad hoc working group of Congress members interested in supporting better relations should be reactivated and become involved in discussion of the case. The Alliance for Retired Americans Political Action Fund endorsed Bobby Rush in 2014, for 2012. “We’re glad to see so many Members of Congress expressing respect for the right of the Salvadoran people to determine their own future. That’s an attitude that’s sorely lacking in much of the US’ policy in Central America, especially with regard to economic policy,” said Alexis Stoumbelis, Executive Director for the pro-communist Committee in Solidarity with the People of El Salvador (CISPES), in Washington, DC, which has observed every post-war election in El Salvador, starting in 1994. Signatories included Rep. Bobby Rush ..
May 15, 2015, Sixteen Democratic members of the U.S. House of Representatives signed a letter calling on President Obama to withdraw sanctions on seven Venezuelan government officials, and also to withdraw the language of an executive order justifying the sanctions. The sanctions to which the letter refers were based on legislation voted by Congress in December and signed by the president on Dec. 18. On Mar. 9, after the arrest of several Venezuelan political figures whom Venezuelan President Nicolas Maduro accused of plotting a coup, President Obama issued an executive order declaring an "emergency" on the basis of a supposed "unusual and extraordinary threat" to the United States and its interests by Venezuela, and imposed the sanctions, mostly on mid-level security personnel. The sanctions prevent them from traveling to the United States and freeze any assets they might have in this country. The congresspersons who signed the letter were: Hank Johnson, John Conyers, Barbara Lee, Raul Grijalva, Keith Ellison, Jose Serrano, Sam Farr, Karen Bass, Jan Schakowsky, Jim McDermott, Bobby Rush, Sheila Jackson-Lee, Mike Capuano, Charles Rangel, Chellie Pingree, and Earl Blumenauer. Rep. Bobby Rush (D-Ill.) (October 2016). Representative Bobby Rush was part of President Barack Obama's March 2016 delegation to Cuba. This page was last modified on 14 March 2019, at 04:01.